You are here: Home / Brazilian Jiu-Jitsu / What does it take to get the next belt? What does it take to get the next belt? 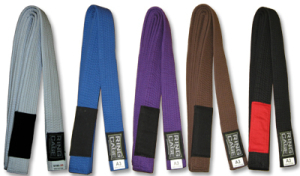 What does a BJJ belt signify? Is it ability? Seniority? A reflection of one’s character? There is no set definition and opinion is definitely divided. A BJJ belt is awarded by a practitioner of higher rank. A purple can award a blue, a brown can award a purple, and a black can award a brown. A black can only be awarded by another black of at least two stripes. 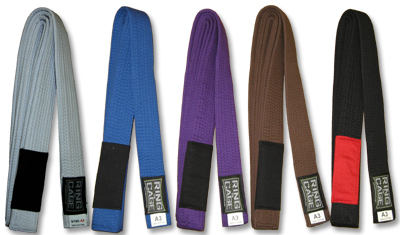 There is no fixed criteria in awarding a belt, it is up to the one doing the grading. This can result in confusion for those wondering what they have to do to get the next belt, if they don’t know what criteria is being used. Here is my criteria for grading and my thoughts on what BJJ belts signify to me. If a BJJ athlete were to enter a competition in their age and weight division, at what belt rank should they compete in to best improve their jiu-jitsu? If I feel an athlete would gain more beneficial experience by competing as a higher belt, then I award them that belt. A belt is a tool to help you improve your BJJ. It has no other significance. Q: What do you mean by beneficial or harmful? How can having a belt be harmful? A: A belt comes with expectations of ability. If you are wearing a belt you don’t feel you can back up, you’re likely to avoid rolling with people that challenge you. If you don’t have challenging rolls, you don’t improve. Q: Do I have to compete to get the next belt? A: No. The belt is simply a reflection of who you would compete against if you do choose to compete. Q: Do I have to know technique X to get the next belt? A: No. BJJ is about learning to grapple effectively with your personal combination of strengths and limitations. Q: I go to other gyms and smash higher belts. Why haven’t you graded me? A: Gym training is not competition training. How do you perform when you’re stressed and tired? How is your mental resilience? Q: I really want the next belt! A: Do you want the belt or what it represents? If you just want the next belt go buy one, or better yet, skip some steps and buy a red one. Q: What do need to do to improve my BJJ? A: This is the only question you really need to ask. Come talk to me. https://8020bjj.com/wp-content/uploads/2013/06/logo1.png 0 0 Dion Mendel https://8020bjj.com/wp-content/uploads/2013/06/logo1.png Dion Mendel2014-11-10 17:11:522018-03-18 15:33:43What does it take to get the next belt?